I often get asked how I find the time to do so much baking. The truth is, I don’t know! But I think if you enjoy something then you always manage to find time to fit it in. I would love to be able to bake something new everyday and then post it on here but the truth is that if I did that then I’d probably end up so fat that I’d be unable to get out the house. Instead, I’ve decided that I’m going to restrict myself to baking one, or maybe two new things (or maybe more if there are special occasions) a week to put on here. I have a whole load of cupcakes which I baked before I set up this blog so in between baking new things, I’m going to blog about them – provided I’ve got good enough/good photos since most were just taken on my phone! I made these cupcakes for my birthday this year. On the evening of my birthday I went out for cocktails so I wanted to stick with the theme and decided to make four different cocktail flavoured cupcakes: Mojito, Brandy Alexander, White Russian and Pina Colada. Given they’re all quite different, I’ll be doing a separate post on each one. 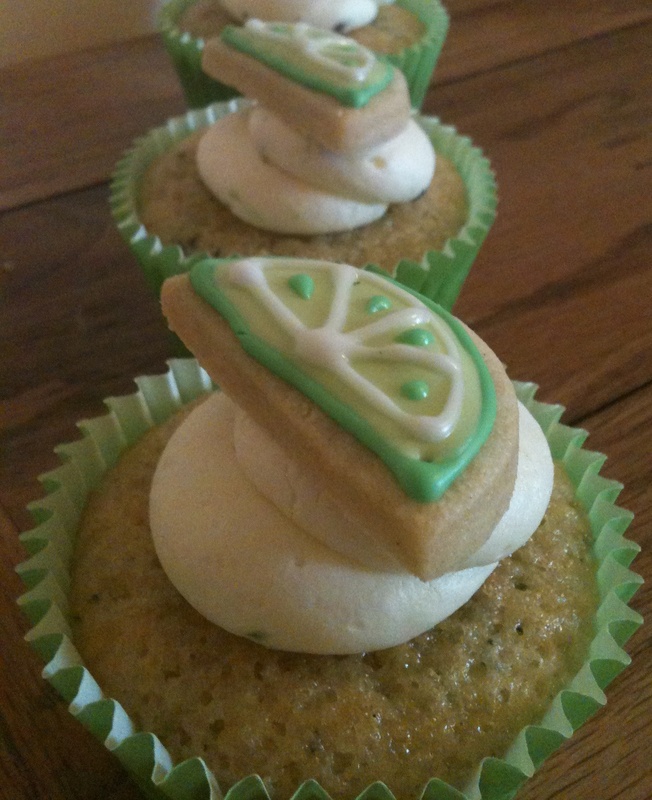 I think the mojito ones were my favourite so I’m going to start with – they really do taste like the real thing! 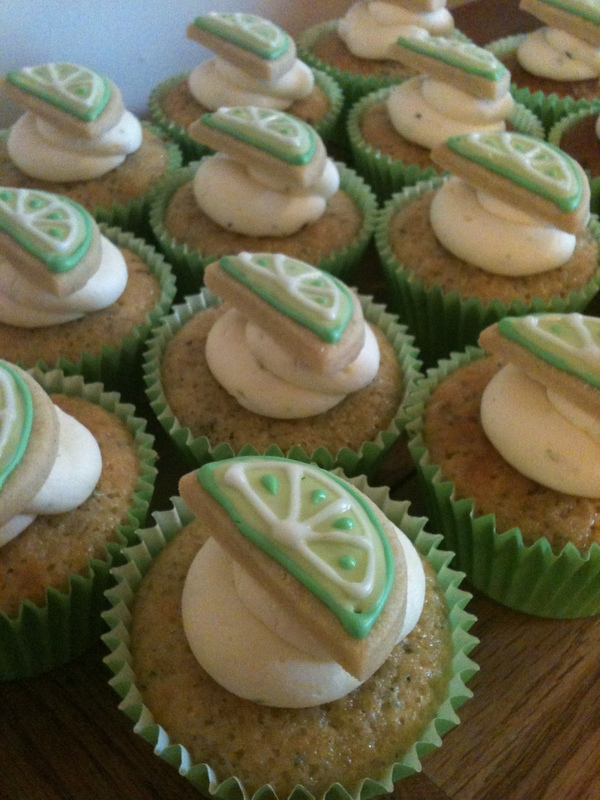 I tried to come up with a different decoration for each cocktail and decided on lime slice cookies to go on top of these. I made a basic biscuit dough (which I’ll be posting soon) which I added some lime zest to, cut out circles and then I cut them in half and baked them. Finally I piped a dot of dark green into each segment and then used a cocktail stick to drag it to create a teardrop shaped “pip”. The recipe is from the Hummingbird Bakery’s Cake Days book again – before you ask, yes, I think I have now made all the cupcake recipes (plus a few others) from there so I think it’s time to move on to my next recipe book…. In a saucepan bring the white rum and 60g of the sugar to the boil, reduce by half and set aside. Mix the sugar, flour, butter, baking powder, lime, lemon, mint and salt together in a stand mixer (or rub in with your hands) until the mixture resembles fine breadcrumbs. Beat the milk, eggs and vanilla together in a jug and then gradually beat into the dry ingredients until smooth (ensuring that you scrape down the sides of the bowls after each addition). Divide the mixture evenly between the 16 cases (each one should be about 2/3rds full) and then bake in the oven for 18-20 minutes until they are lightly browned on top and spring back when pressed (and a skewer comes out clean). I usually check them and turn them around after 15 minutes. Take out the tins immediately and whilst still warm, drizzle a teaspoon of the rum reduction over each cake. Leave to cool on a wire rack. Decorate once completely cool. Beat the icing sugar, lime zest, lemon zest, mint and butter together on a very slow speed until the mixture resembles coarse breadcrumbs. I always put a tea towel over the top of my KitchenAid to prevent icing sugar going everywhere! Then slowly add the milk and white rum. Once it’s all been added increase the speed and beat on high for 5 minutes until light and fluffy. They look so pretty– I love how you decorated them! Are these fairy cake cases or muffin cases please? they are muffin sized cases!